High-sensitivity thermal (thermopile) sensor and USB power meter interface kit. The kit was developed particularly with low light/indoor irradiance measurements for solar cell characterization in mind. 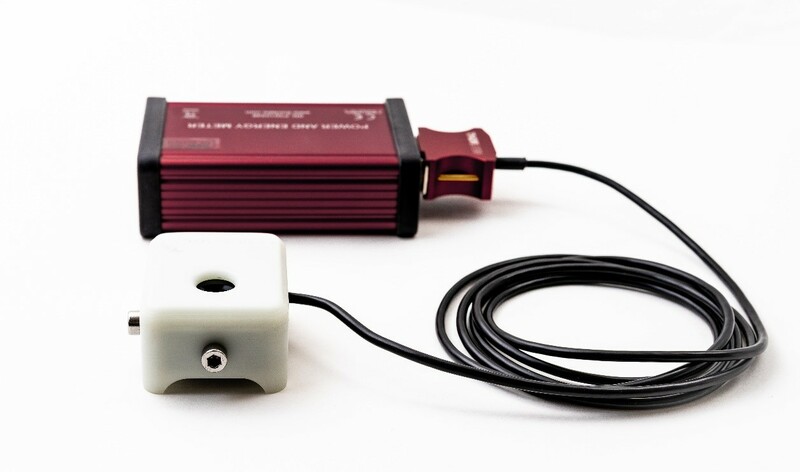 The sensor’s practically wavelength-independent response to light makes it ideally suited for direct measurements of optical radiometric quantities such as irradiance (i.e. mW/cm²) and radiant flux (mW). Because of the sensor’s thermal background compensation, light intensities as low as 10 µW or 12.7 µW/cm² (taking the sensor aperture into account) can be measured. This corresponds to around 10 lux of sunlight or 30 lux of white LED light. Thanks to the Dyenamo-developed cover included in this kit the sensor can be used for measurements under conditions where the illumination is not limited to the aperture area. This would normally cause the sensor body to heat up from the radiation absorbed by it, resulting in a drift of the measurement. The USB power meter interfaces with a computer running the included software which is used for readouts and logging of the measurements. The sensors are individually calibrated and come with NIST- and PTB-Traceable Certificates of Calibration.